Musings of a Durotrigan: Nick Boles reveals meaning of Cameron’s ‘war on red tape’: farewell England! Nick Boles reveals meaning of Cameron’s ‘war on red tape’: farewell England! Coming a little over a week after David Cameron delivered a speech to the CBI in which he declared his intent to wage ‘war on red tape’, Planning Minister Nick Boles has fleshed out in a Newsnight interview what this will mean in practical terms for vast swathes of English countryside: farewell! For Boles has declared that he would like to see the percentage of land built upon in England increase from 9% to 12%, some 1,500 square miles lost beneath concrete and tarmac. This, quite plainly, is the ineluctable consequence of our de facto open borders policy, and illustrates in the most stark terms why mass immigration is intensely damaging, not only to the fabric and character of our landscape, but to our flora and fauna. A ‘war on red tape’ may well be a phrase that plays well to the ears of members of the general public who find complex aspects of Whitehall regulations a bane in many respects, but bundled up within Cameron’s declaration were clear and worrying implications for our countryside. However, a week ago the press largely ignored this aspect of his speech, with for example, the stridently self-declared advocate of environmental issues, The Guardian, becoming irate not about this threat to our countryside, but choosing to focus instead upon Cameron’s pledge to axe ‘equality impact assessments’. For The Guardian, it would matter not one whit if the entirety of England were to be concreted over and transformed into a global megacity, providing that it was of course carbon neutral, thereby being in its opinion genuinely ‘Green’. What then, in practical terms, can be done to prevent this ‘development’ which in reality would better be described as the destruction of our national natural environment? Will the Campaign to Protect Rural England step in to champion opposition? What of the Woodland Trust? 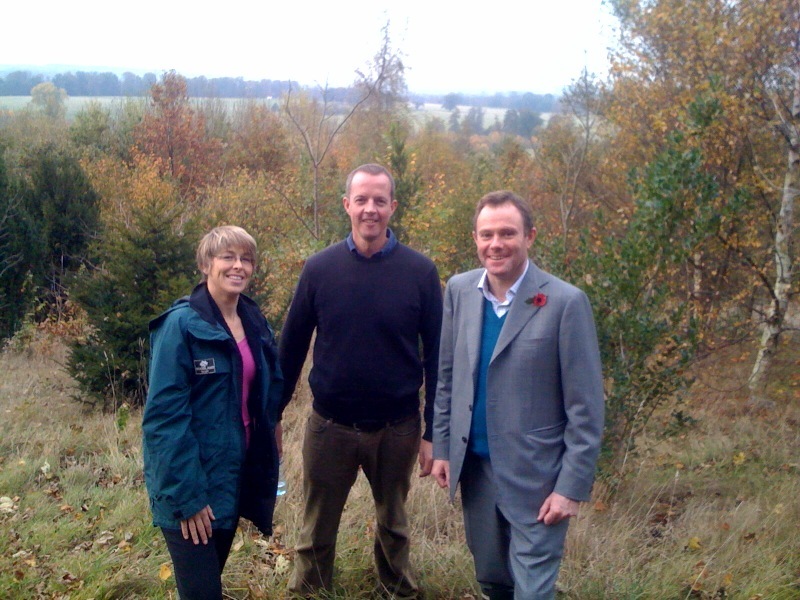 As can be seen from the picture below, it does seem a touch odd that Nick Boles (centre) should choose to have himself pictured with members of the Woodland Trust, when quite clearly he would happily see such woodland uprooted and flattened by the bulldozer, to make way for homes needed because of a population boom that has been almost exclusively fuelled by mass immigration and the higher birth-rates of the immigrant and immigrant-descended population. The answer to the housing crisis lies not in covering another 1,500 square miles of English countryside with ‘development’, but rather with a combination of strict controls on immigration, and the redevelopment of genuinely brownfield sites in urban areas. Mass immigration is the root cause of this problem, and ending mass immigration will be its only solution. Migration Watch has drawn public attention to this issue for many years, and will hopefully be able to generate greater public awareness of this problem, as well as support for its position, in light of Boles's statement. When are Tory voters going to realise that by continuinng to vote Tory they are ensuring that either they or their children and grandchildren will be living in replicas of our 'enriched' inner cities? No doubt many of them moved-out of such areas but by continuing to vote for the PC Conservative Party the problem will follow them! There are fewer and fewer areas you can 'white flight' to! It seems that most of them will continue to gullibly swallow the media narrative that the Tories are an anti-immigration party, and consequently will do nothing other than continue to vote for a pointless part that seeks to conserve nothing other than the material interests of the very well-heeled few. Sadly, I think you are correct. I live in Brentwood, Essex which is a Tory stronghold and always has been (My MP is Eric Pickles who got over 50% of the vote even in 1997). Even though it is on the edge of Greater London, it has always been very white and no doubt this is one of the reasons for the very strong Tory vote here. However, in the last two or three years we have been getting a small ethnic population and I genuinely think we are having failed 'asylum seekers' dumped on us and the Tory council is co-operating fully with this. I went into the local council offices about two years ago and noticed a 'diversity strategy' document for public comsumption! Eric Pickles? Oh dear. Perhaps he would like to make Brentwood demographically resemble his home city of Bradford. As for the ‘diversity strategy’, I’m sorry to say that nobody can opt out of those these days, as it’s illegal not to possess such a document. Go against it and you’ll get sacked and called all manner of unmentionable things. What I find so infuriating about this situation is that the question of why we "need" these hpusing developments has been completely ignored by the government and by the likes of Adam Boulton and others who conduct discussions on these awful tv "news" shows. The simple truth is that these ministers couldn't give a damn about our landscape or our wildlife. If they did they would be saying "We don't want to concrete over the countryside and we have come to realise that the demand for housing is caused by mass immigration. The British governemt is under no obligation to provide housing for foreigners and to expect us to give them the very ground from under our feet is utter madness." We have now surely reached the point at which people will finally realise the horrifying implications of the post-1997 invasion. For any government that is serious about turning the tide and preventing the awful long term consequences of mass immigration, the housing crisis presents an ideal opportunity to reverse the inflow. The stark reality of not providing immigrants with housing leaves the invaders with only one option i.e. return to their country of origin or find another host nation. I realise that this sounds like a gross over simplification, but it stands to reason that if they can't find a place to live here they will have to find one somewhere else. Of course, we can expect them to turn nasty, but that will only be to our long term advantage because it will show them to be what they really are - invaders of our homeland, nothing more nothing less. But in the end we come back to the same old problem. We will never get through conventional means a government that is prepared to take the necessary measures. When you stop and think about it, the period that we're living through must be almost unique in the history of human civilisation. We're witnessing a process of destruction and ruin which is being deliberately visited upon us by our own rulers. All the worst consequences of being invaded and trampled upon are being inflicted from within. It's quite unbelievable. Exactly.This stance of trying to protect our enviroment by severely restricting immigration is the only way, I think, of waking well-heeled Tories up (in particular) to the damaging consequences of mass immigration. If the prospect of having their nice middle-class areas into replicas of Brixton and Bradford doesn't wake them up then I can't forsee any other stance that will. If the Green Party had any sense (ie if they weren't the 'watermelon' party with green on the outside and red on the inside)they would adopt a tough stance on immigration too. That would make their focus on enviromental issues more credible. What you say about the Green Party could also be said of bodies like the RSPB and other conservation groups. The RSPB will bemoan habitat loss caused by modern agricultural methods, etc. but it doesn't seem to say anything about the looming apocalypse caused by immigration. This is an organisation which boasts a million or so members, many times more than LibLabCon can muster, yet they don't seem to be lobbying the government to avert what will prove to be an unprecedented environmental catastrophe. Kind of sums up the lily-livered, head-in-the-sand mentality of mainstream Britain. The National Trust also seems to be quietly looking the other way. These organisations are filled with the wrong people, simple as that. Stievaulx, it is both telling and very wearing that the underlying causes of this ‘need’ for new housing are never discussed, certainly not in the critical and open manner that this issue requires. The long-term consequences are grim, as I for one do not wish to live in a characterless geographical space filled with ‘development’ taking the place of our countryside everywhere. The policy exemplifies all of the flaws of short-term political thinking. It is a disaster. How can it seriously be portrayed as a ‘good thing’? That is what it is said to be, but palpably it is not. Good for whom? Not for us, that much is certain. The Green Party, oddly, does not tend to address genuine environmental matters in our country. It is much more interested in telescopic philanthropy and opening our borders to a limitless flow of immigrants from Africa and Asia. In this respect, it could be considered to be the most anti-environmental party of all, alongside the Liberal Democrats and the likes of the SWP. As for the RSPB, the National Trust and other such bodies, they too will have had the mandatory ‘diversity’ legislation forced upon them. In the wake of Macpherson, any public organisation in this country has to ‘promote diversity’ or face the likelihood of prosecution. where else are we going to house the mass of jobless, indeed unemployable, immigrants? we must house them, pay their taxes and living costs in order that the socialists, including camaron, can retain power. and we must be happy to do so or the socialst outreach workers (AKA police) will pay us a visit and take away our liberty, children and privacy. A globalist Cameron may be, but only the through the refracting prism of US neocon ideology could he be perceived to be a 'socialist'.